Exercising can be fun as there are many ways that it can be done, such as walking, swimming, playing a sport or riding a bike. One of the ways to add something different into your routine is with an exercise ball. These are large balls that you sit on while you’re exercising. They come in all sizes, and there are some smaller balls that you can hold to add more resistance. When you use a ball, it can be a way to add muscle tone. They are also ideal if you want to work on your balance. They are sometimes used in abdominal exercises. You would lay on the ball, balancing yourself so that you can do an abdominal crunch. This kind of exercise will add definition to the body in a way that a normal abdominal crunch wouldn't because you are sitting up while balancing the body on the ball. The ball can improve the flexibility that you have as you will need to stretch in various ways in order to accommodate the ball with the body. If you find that you don’t have a lot of balance while walking or doing other exercises, then the exercise ball is a way for you to improve this area as you will need to find ways to keep parts of the body that you are exercising on the ball. 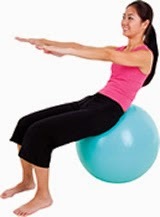 Click here for information about how to get started with an exercise ball.